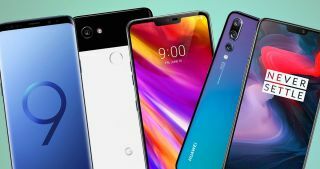 The best Android phones of 2019 are starting to look a lot more interesting, with slimmer bezels and some startling new designs. Given the quantity of killer Android smartphones, it can hard to pick the best of them to suit your needs, but we’ve had plenty of hands-on time to list the best – and the rest. For now, Samsung is still holding strong thanks to its talent for blending features, high specs, and a great design alongside some stunning cameras in its new S10 line. But given the advancements coming from competing Google Pixel and Huawei phones, the roster of best Android smartphones will keep getting more interesting. If you’re on the market for a new Android smartphone, be sure to check all of these devices out, as you might find some you haven't heard of or haven't taken seriously. You can also compare the list to our best phones and best unlocked phones to see how Android and iOS devices stack up. And, if you need mobile service to go with your phone, we can help you find the best unlimited data plan. Without further ado, let’s take a look at the best Android phones available right now. While the Samsung Galaxy S series has only made incremental improvements in recent years, the Galaxy S10 Plus makes a bit more of a substantial leap ahead with new features and an even sleeker look. While the other models in the series have their advantages, the S10 Plus is simply the best of the best – top specs, an expanded camera suite and some shiny new tricks. The Snapdragon 855 at the phone's core competes with the Apple A12 for the fastest chip you can get in phones, and the 8GB RAM makes browsing and gaming speedy. The baseline 128GB of storage is great, but you can also pick up the phone with 512GB – or even 1TB, if you pay for the premium ceramic-backed version (which boosts the RAM to 12GB). If that's not enough, storage can be boosted by 512GB via microSD, bumping potential storage to 1.5TB...whoever should need it. The phone has few drawbacks, with a huge 6.4-inch screen in the smallest frame we've seen thanks to a 93% screen-to-body ratio. The in-screen fingerprint sensor is cool, the ability to wirelessly charge other devices using the new Wireless PowerShare feature is even cooler, and we just love the clean look of the phone. Aces all around...if you're willing to pay the (very) high price. If you hate the smartphone notch, you can still get the best smartphone camera without it. Google’s Pixel 3 comes in smaller and more affordable than its bigger sibling, but it offers the same best-in-class camera performance. The design of the Pixel 3 isn’t quite up to par with the rest of the new flagships from 2018, as it has sizable bezels above and below the screen. It fits a 5.5-inch display with a resolution slightly above Full HD. Though it’s not winning any contests for its looks, the internals are up to the task, with a Snapdragon 845 and 4GB of RAM to power through most tasks quickly. Google’s phones also get timely and ongoing updates to the operating system, so the Pixel 3 may remain relevant longer than some of its competition. The Samsung Galaxy S10e is essentially the iPhone XR for Android: flagship specs at a lower price, with a few features shaved off to cut costs. And yet, the S10e is less of a compromise. It retains an AMOLED display (the XR's is LCD), starts at 6GB of RAM and packs a second ultrawide rear camera to the XR's single wide lens. There are several things the S10e lacks compared to its pricier siblings, but nothing you'll terribly miss: its side-mounted sensor is still more reliable than the in-screen fingerprint sensor on the S10 and S10 Plus. The 2x telephoto lens on its bigger siblings isn't as useful as the ultrawide sensor it keeps. But most importantly, it's a cheaper, smaller phone in a sea of Android phones that are getting larger and pricier. The S10e is a more distinct alternative to the S10 Plus than the standard S10, which ends up being a middle child that doesn't quite earn its price hike from its budget flagship sibling. For brilliantly high performance and the looks of a premium Android smartphone all at a fraction of the price of the competition, the OnePlus 6T is the phone to get. The new flagship from OnePlus has leapt ahead of some of its biggest competitors, Apple and Samsung included, to push forward a 6.41-inch display that has almost no bezel, a tiny notch, and a fingerprint sensor built into the display. OnePlus’s cameras have also improved, making them close in quality to some of the best smartphone cameras around, if not quite as good. OnePlus also does a great job offering tweaks to Android that improve the experience without introducing a bunch of clutter. The Samsung Galaxy S10 is an incredible phone – a true flagship that ticks all the boxes and even has a few new tricks that make it a bit more than just an incremental upgrade over the Galaxy S9. But with the addition of the 'budget flagship' S10e to the S10 line, the standard edition is a bit harder of a sell. Don't get us wrong, it's still a fantastic phone. Packing the latest Snapdragon 855 chip and doubling the RAM to 8GB makes the standard S10 a powerful device, and the baseline 128GB of storage is very welcome. The new in-screen fingerprint scanner is pretty cool, and the extra 2x optical telephoto and ultrawide lens are reasons alone to pick this over last year's Galaxy S9. The new Wireless PowerShare is very handy in a pinch to charge other devices. But for a noticeable price cut, you aren't missing much if you opt for the S10e; and on the other side, for a bit higher price, the S10 Plus offers a slightly larger screen, another selfie camera for portrait depth, and a higher spec ceiling. Thus, the standard S10 is likely for folks who want a flagship that's not too big, not too small, yet is powerful enough to last years of use. Huawei's P series has always taken photography seriously, and the P30 Pro takes that to an extreme. Where other phones have struggled to fit more than a 3x optical zoom in ever-slimmer phones, Huawei circumvented that limit with a novel design: lay its lens stack along the phone's length and use a mirror to reflect it out the rear cover. Hence the "periscope" lens, which manages 5x optical zoom, a 10x digital zoom and a baffling 50x full digital zoom. The phone is no slouch in other departments, either, sporting Huawei's latest Kirin 980 chip to reach speeds on par with Apple and Samsung flagships. Respectable RAM and storage round out the phone's specs, but you'll pick up the P30 Pro for its astounding photo capabilities, which include impressive DSLR-level ISO, per Huawei's claims. Alas, Huawei phones aren't the easiest to get in the US – you'll have to pick them up wholesale from a retailer, since no carrier currently sells the company's devices and network support is limited. If not for that scarcity issue, this phone would likely rank higher in our list. But if sourcing your phone isn't much of an issue, the P30 Pro looks to be a great choice. The Galaxy Note 9 may not reign supreme after other phones have surpassed it this far into 2019, but its high specs and handy stylus keep it on our list of best Android devices. With a sharp, 6.4-inch Super AMOLED display, the Note 9 offers a great viewing experience for anyone that’s on the go often. Inside, it’s powered by the same components as the Galaxy S9 Plus, but with larger storage capacities available, a bigger battery, and more RAM optional. The Galaxy Note 9 sets itself apart with the S Pen, which enables some handy hands-free features and smooth note-taking. The cameras on front and back are just as impressive as the Galaxy S9 Plus shooters. For everything that the S9 Plus offers and a little bit more, this is a winner if you have the wiggle room in your budget. Huawei’s Mate 20 Pro isn’t the easiest to get your hands on in the US, but that doesn’t make it any less impressive a phone. It’s the best we’ve ever seen from Huawei, and stacks up well against all other Android phones. It’s QHD display measures 6.39 inches and supports HDR10 for a great visual experience, as long as notches aren’t an issue There’s a fingerprint sensor embedded underneath the display as well. Inside, it’s offering impressive performance with Huawei’s own Kirin 980 chipset and 6GB or 8GB of RAM. It comes with plenty of storage and a large battery as well. The camera offering on the Mate 20 Pro is truly impressive, with a combination of three cameras on the back and a super-sharp 24MP selfie camera. The rear camera system combines a 40MP wide-angle sensor, an 8MP telephoto sensor, and a 20MP ultra-wide sensor. The result is an incredibly versatile snapper with AI backing it up. Google’s Pixel 3 XL is a bit bigger and blockier than its smaller sibling, with sizable bezels that are less and less ignorable in 2019. The phone still has one of the best camera setups on the market, and it does that with just one rear sensor, two front-facing sensors, and a whole lot of software optimization, so credit where credit is due. The design of the Pixel 3 XL isn’t quite as dazzling as the other offerings on this list, but it’s passable. It boasts a 6.3-inch OLED screen, but has a glaring notch at the top. The dual front-facing speakers help make up for that unsightly notch. The internals are also competitive with the other flagship phones. And, with regular operating system updates guaranteed by Google, the Pixel 3 XL may have a longer life than some of the competition. While many try, it can be really hard to beat a Samsung flagship that nails just about every aspect of being a great Android smartphone. The Galaxy S9 Plus offers so much to meet the varied needs of just about any phone user. Even after it's been surpassed by the S10 Plus, the venerable S9 Plus is still a quality phone that you can now get pretty cheap. The design of the Galaxy S9 Plus is great, with a nearly bezel-less display measuring 6.2 inches across. That screen is crisp with a high resolution, and it’s only made better by the Super AMOLED technology. And, let’s not forget about the inclusion of a 3.5mm headphone jack and an IP68 rating against water and dust ingress. Pair that great design with powerful internals, ample storage that’s expandable via microSD card, and a suite of capable smartphone camera sensors, and you’ve got an easy winner. The pot is only sweetened by the lower price of the Galaxy S9 Plus compared to phones like the Mate 20 Pro, iPhone XS, and Galaxy Note 9. LG may not be as present in the collective phone consumer consciousness as it once was, but it’s recent smartphones have been quality options. The LG G7 ThinQ is a testament to that. Inside, the LG G7 is similar to other flagships, with a Qualcomm Snapdragon 845 chipset and 4GB or 6GB of RAM depending on the device’s storage size. It has a 6.1-inch display with a sharp 1440 x 3120 resolution, and can offering a blazing 1000 nits when you really need to see the screen in direct sunlight. The dual-sensor system on the rear offers both a standard camera and a super-wide-angle lens for versatile shooting. AI helps the cameras along as well, recognizing scenes and subjects to dial in the settings so you can get a good shoot.